This article (http://tronola.com/html/hf-60_with_6550s.html) discusses possible improvements and modifying ideas. I used some of them in this build. The power supply is my own design (regular bridge/cap/inductor/cap) PI filter. After a bit of to and fro', the sound is settling beautifully. The EF37's were chosen in stead of EF86, since I recently acquired a whole hoard of EF37's that begged to be used. KT66's were handy, since the 6550's are still on order. A very appealing sound. If you like music loud, this may be the way to go. Now that is an amp I like! I can understand the circuit. No nonsense. @JonnyP - The improved design ( with 6550's that Karel is waiting for ) delivers 60wpc .
" Power output is now easily 60 watts RMS from 20Hz to 20kHz, with all distortions significantly reduced over that of the original design as previously noted. Frequency response is slightly and intentionally reduced to 70kHz +0/-0.5 dB (down from the original spec of 90 or 100kHz ± 0.5 dB depending on which design you had), but in return, low and high frequency stability is now rock solid: Pulse conditions settle virtually instantly, while no value of capacitance across the unloaded 16 ohm secondary causes any tendency towards oscillation. The original design would fail this test miserably. With the new design, the effect of the improved stability is very noticeable in the presentation of detail. Overall, the modification produces a sense of effortless power, and great clarity. " Methinks you would probably need parallel push-pull to do the 100wpc with ease . 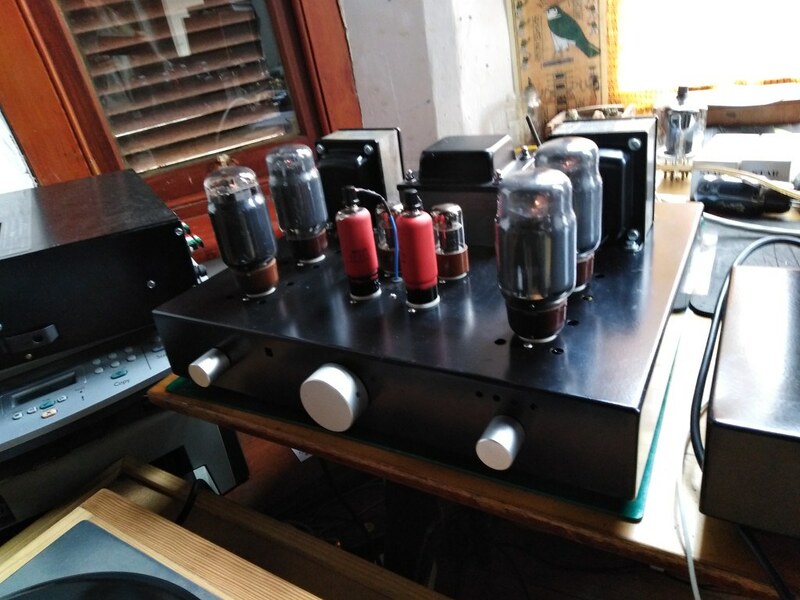 100wpc is possible with a pair of KT88's or even a pair of EL34's , but the tubes would probably being run at their absolute limit . Still - 60wpc ( perhaps heading on 70 wpc ) of wideband undistorted tube power is quite a lot already . Update: the amp has been playing for a week now. The high frequency response was extreme and I had to listen to music at whisper levels to not get a head ache. This is an amp that needs taming. And the bass response is lacking. I tackled the bass response first. I tried more capacitance at each PSU node; no improvement. Enlarging the coupling caps to from 0.22 to 0.47uF did give me the bass I needed. I did the aikido trick and coupled the PSU rail to the phase inverter grid via a 0.22uF cap. I also bypassed the all the PSU electrolytics with polypropylene caps. Lastly I enlarged the 220pF NFB cap to 1000pF. Listening to music is much more fun now. I might remove the 1000pF NFB bypass cap next. The sound is very clear and powerful. Update: I was talking to fredeb about the amp, and he mentioned C11 being peculiar, since it is only on one anode. I realised that I have left C11 out! We'll that was a mistake. I added a 390pF on both channels, and the sound shifted dramatically. Top edge gone, bass more prominent. At the moment I have C7 as 220pF. I might go back to 68pF as suggested by Gillespie. Then to try out the negative rail on the phase inverter. One needs to be careful here. 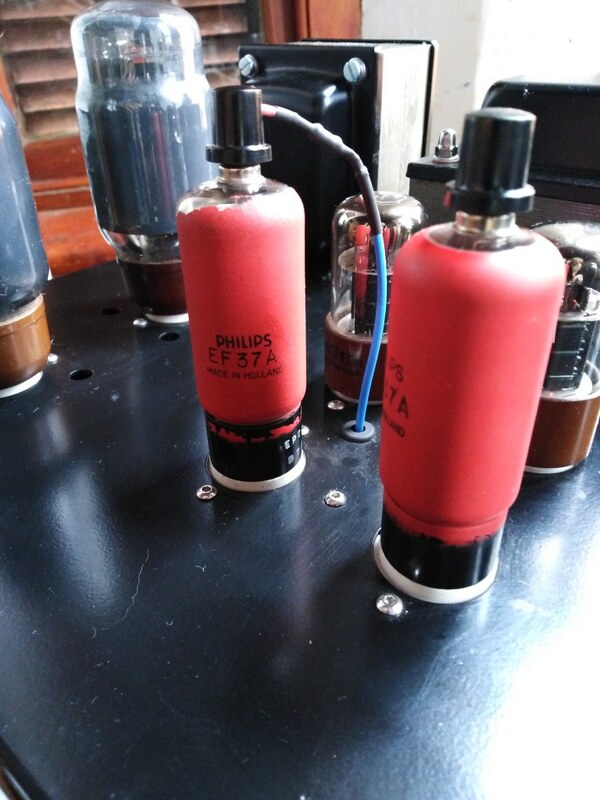 C11, C12, C13 (in connection with R22, R23) form supersonic phase correction, from about 40 KHz to over 120 KHz. Likewise C7 curtails open-loop frequency response above 26 KHz in order to keep NFB stable. Making C7 = 220pF starts roll-off at some 9 KHz. Point: One needs to rather check operation involving these capacitors with an oscilloscope and a say 5 - 10 Khz square wave to watch for over/undershoots/instability. By the time you can hear a difference with music, case might be that the 'poor sounding' side is already suffering from instability, as all of the above except C7 has effect only well above the audio band (guesstimate some 40 Khz to 120 KHz, also directly dependant on OPT h.f. characteristics.). I will check the ringing at 5 to 10k on the scope and report back. The OPT's do not have 16ohmm output taps, so the C12/13 network will have to adjusted. I have 4 ohm and 8 ohm though. Do you have any idea how to adjust R22 and R23 accordingly? 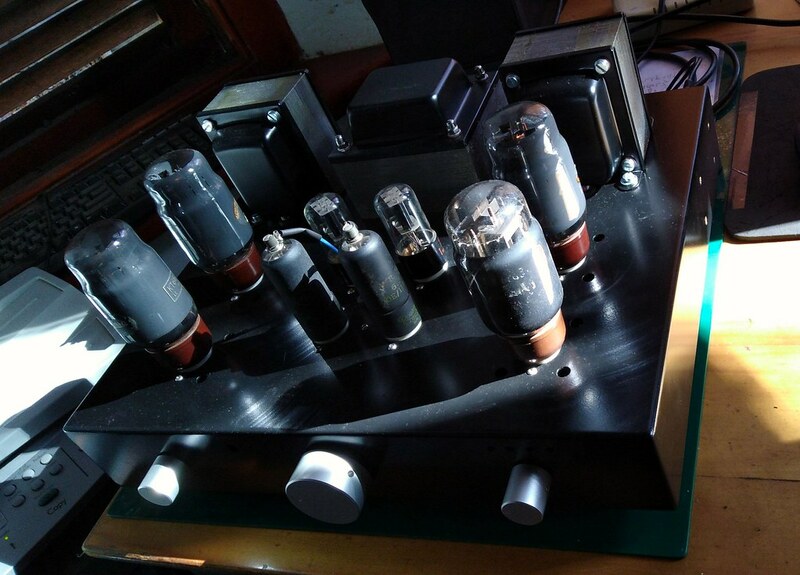 The amplifier has passed listening tests, and has been delivered to the customer. I took a photo just before delivery. Damn ! I wish I'd have made a turn to hear it before it left - must be quite a beast . Apology! I seem to have missed this question. But the values of C12, C13 are entirely a function of the OPT characteristics. They work in the supersonic region, to compensate for OPT internal capacitance and leakage reactance (thus phase correctors.) Their effect for that particular OPT is somewhere >60 KHz and certainly cannot be trimmed by hearing. Thus I cannot recommend values for your OPT; to get those right one will need a square wave generator and oscilloscope to check. Also the necessity of C12 might indicate some inequality between secondary sections of the particular OPT; ??? I have always just used a single RC feedback combination from the whole secondary, but that is with using all secondary windings for both 8 ohm and 4 ohm outputs (for three secondary sections the usual 30% - 40% - 30% secondary winding segmentation). Thanks for the input, Ampdog. My testing of the transformers I roll, have shown the best results for square wave test with a 47pF cap paralleling the feedback resistor (one resistor instead of R22 and R23). 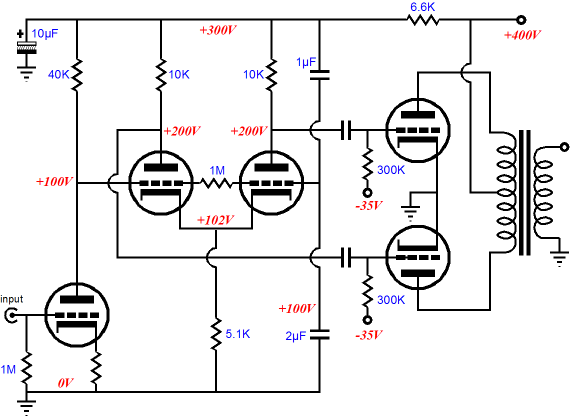 This is also working well in this circuit. If I may be a mite tutorial also for the benefit of others reading here: That compensating capacitor and others are all working together - to at the 'other' side', compensate for the phase shifting effects of small capacitances, mainly at the input stage but also all over the show, trying to keep control, until the amplifier loop gain has fallen to below zero at some supersonic frequency, at which point instability is no longer possible. (Do read up on the internet!) This phase shifting also includes OPT leakage reactance. That C is thus determined for every separate circuit on its own. In Karel's circuit the OPT already seems to be well within control. 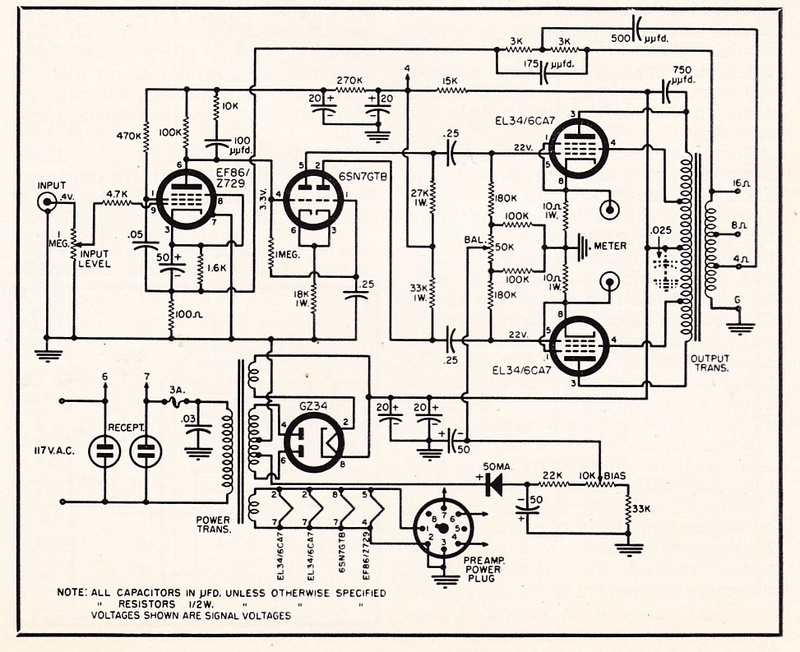 Let us for now forget about the contribution of the 4 ohm tap in the Gillespie circuit, and the 'funny' divided feedback circuit. Other circuits are suggestions, not prescriptions. End of tutorial! So, Mr Mars, good fortune to you; you know what to do!